Every writer has their favorite writing tools. 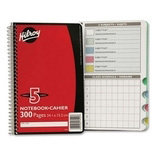 One of the most important of mine: my Hilroy notebook. I’ve used a lot of different notebooks over the years, but these days I stick with my 5-subject 8″x5″ Hilroys. They’re small enough to easily carry around, but not so small it’s difficult to write anything substantial. And the five sections allow me to separate out random ideas from notes on specific projects. Less time spent searching for that brilliant inspiration for the WIP. I was very sad when the closest stationary supply store stopped carrying them. 🙁 But thankfully I can get them online! I bring my current notebook with me everywhere. I write down any ideas that strike me while I’m out and about, and I continue working on my writing during my commute and any other opportunities I have. I usually do preliminary outlining in my notebook, and I’ll also often break down the scene I’m going to write next in more detail, or brainstorm solutions for problems I’ve run into. For some reason I think differently with a pen and paper than in front of the computer. And the thinking I do on the paper lends itself better to exploring ideas. When it comes to the pen part of the equation? I really don’t care as long as they last a long time before going dry! I love my writing notebook. It’s actually a sketchbook, with a library pocket glued inside the front cover to hold my pencil or pen. I take it with me a lot of places, especially when waiting for my kids at lessons (dance, swimming). I agree that I seem to think differently when I’m writing with a pen or pencil – I add all kinds of marginal notes and arrows. Thank you for the offer, but that’s all right! I like my notebook off the computer. 🙂 And I have a pretty cool Notebook program already on my iPad.